If you are out of ideas on how to make your desktop look more interesting, EarthDesk might be the answer you are looking for. The application replaces your desktop wallpaper with a well rendered image of our planet, which is updated automatically, almost in real time. This includes clouds, sunlight and other meteorological or geographical details, which are gathered from an online database. 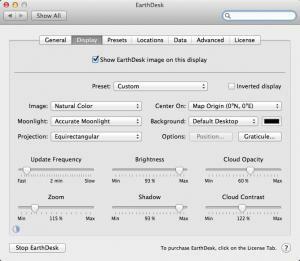 The best part is that EarthDesk is fully customizable. Once you download, extract and run its installation file, the application will integrate itself in the System Preferences panel. It will add a new tabbed menu, with a large number of customization options. You can replace your desktop wallpaper with the live map right away, just by clicking a button in the lower region of EarthDesk's menu. It takes less than a minute to replace the desktop and to apply all the current settings in the menu. You can make any kind of tweaks, at any time, in the application's menu. Furthermore, all settings are applied immediately, so you can experiment with different configurations and view the results right away. It is also possible to create presets, if you wish to apply a complex set of configurations instantly, with a single click. The application allows you to choose between various map types, from a natural-looking map to a relief or a political map. It also allows you to tweak many aspects of the map, like its brightness, shadows, cloud density and contrast and others. Other interesting customization options can be selected, to display the current position of the sun and moon and of the International Space Station. You will also appreciate the fact that EarthDesk allows you to mark and label any city in the wold. The map is updated automatically almost in real time. The application allows you to customize your desktop map in various ways. You can highlight cities, reveal the position of the sun, moon and of the ISS. There are no obvious design flaws or functionality gaps to mention. Running EarthDesk on a computer is like looking out a window in outer space. You can download EarthDesk free here.